Some people call these gingersnaps, while others call them ginger cookies. I’ve opted for the British name because the idea to make them recently came up as a suggestion from a British woman who attended our recent Vegan Cooking Workshop. We just completed making a round of our delicious Gluten-Free Chickpea Shortbread when the woman (let’s call her Sarah) wondered if they would work with some ginger. It turns out she really missed enjoying a good crisp ginger biscuit to dip into her tea. Well, that was all the encouragement I needed, so we immediately made another round of the shortbread and added dried ginger and diluted the chickpea flour with some corn flour. 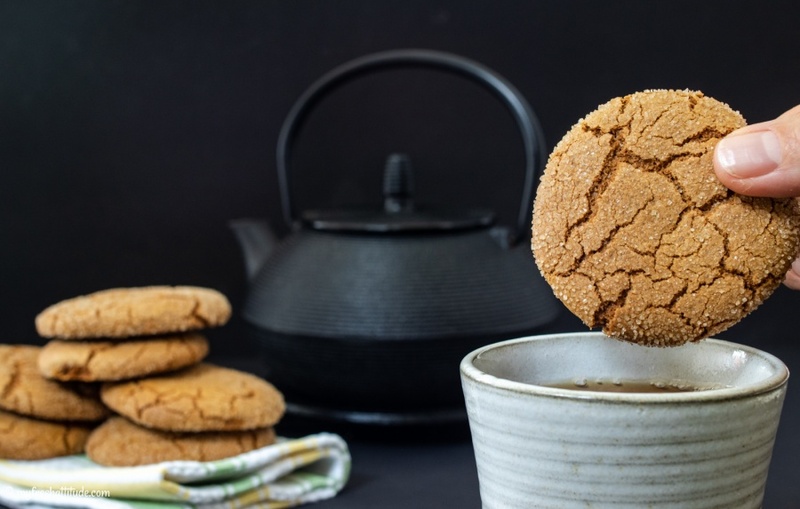 The result was ok, but not quite what a good gingersnap should be – you know, really heavy on the ginger flavor, dark golden color, very crispy and exceptional when dunked into a hot tea. My goodness…talk about comfort food…oh, sorry about getting carried away. After a week or so, I decided to give it another go. I began by researching a number of excellent traditional recipes from some very credible and good sources. I looked on the internet to see what other vegans were doing and then began to combine ideas and mix them with my shortbread idea. The result are these biscuits (please don’t call them cookies), which can be made in less than one hour – from that initial thought of, ‘I want biscuits’ to pulling them out of the oven and suddenly wondering how you will resist grabbing one while they cool.